[Added] Added icons to known file types in the list view. 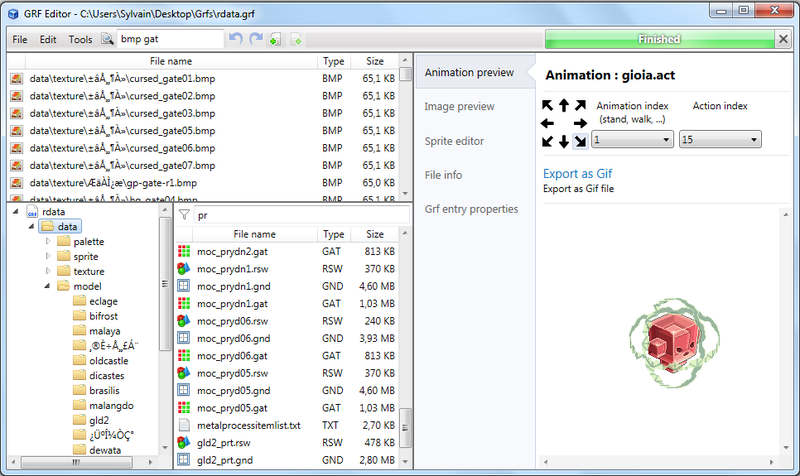 [Added] Added a simple GAT file editor. [Added] The executable now uses compressed assemblies (reducing the file size by a lot). [Added] Folders can now be "previewed". [Added] Folders have a new tab feature "Folder structure" which shows you various info about the node in the GRF. [Added] Improved the loading performance of the software (only required services are being loaded, not all of them). [Added] Database Editor can now read Hercules's item_db file (the file must end with .conf). [Added] RSM (model) files can now be previewed (if the model isn't being shown properly, don't worry about it! 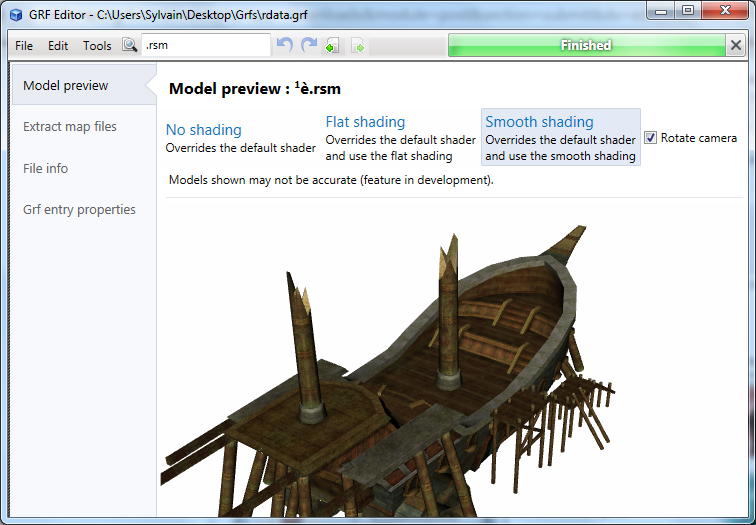 WPF 3D has issues with transparency). [Added] Added two new options : "Navigate Backward" and "Navigate Forward". This allows navigating through the files that have been selected. [Added] Undo, Redo, PositionUndo, PositionRedo all have their icons in the menu bar for easier access. [Added] Known files can now be viewed in a tree view style rather than the old plain text version. [Added] A debugging stack trace viewer is available through the Settings page. When running, this tool will track all the exceptions and report them to you (this is useful when issues are being ignored when they shouldn't). [Modified] Added files in the GRF are now locked (this feature cannot be disabled because moving files in Windows Explorer after adding them in the GRF will cause the GRF to be in an invalid state). [Modified] The Settings, Database Editor and Flat maps maker pages got an UI upgrade. 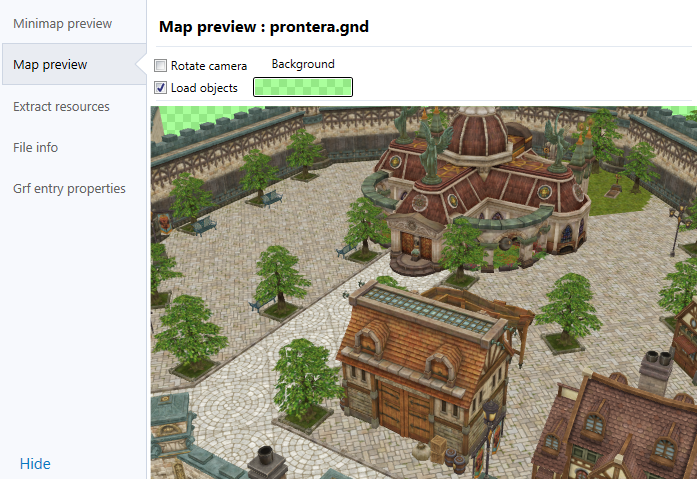 [Modified] The previewing system has been remade and it can now offer a lot more options. As always, no uncessary information is being loaded so the performance is the same overall. [Modified] The encoding option has been moved to the Settings page since this option doesn't have to be set all the time. [Modified] Made the node selection smoother (when selecting a file with the Select command). [Modified] Changed the progress bar UI to show the cancel button all the time. [Removed] The older style (the orignal one that came with this application back in 1.0.0) is no longer supported. [Removed] The options "UI custom style" and "UI transparency" have been removed, but can still be accessed through config.txt. 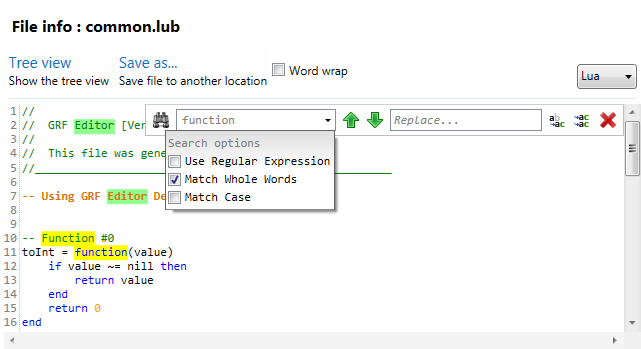 [Fixed] Database Editor's close button is now working. [Fixed] Settings in the tree behavior are no longer conflicting with each other. 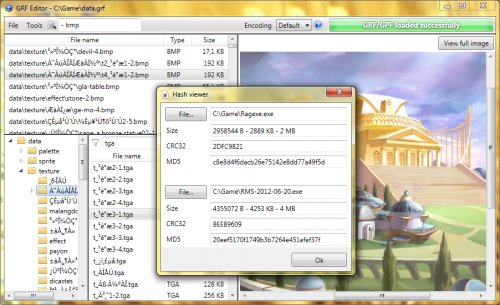 [Fixed] Bug when saving while the GRF is already being saved, made the GRF invalid and removed the original file. [Fixed] The installer required a version of .NET inferior to the one actually needed. [Fixed] RenamingService was able to rename files to "" even though it would say "Invalid file name". [Fixed] DeletingService is now able to delete files in chunk rather than one by one. The behavior has been changed as well. [Fixed] The assembly loader threw exceptions for custom themes; this is no longer the case. However, the basic default style will be applied. 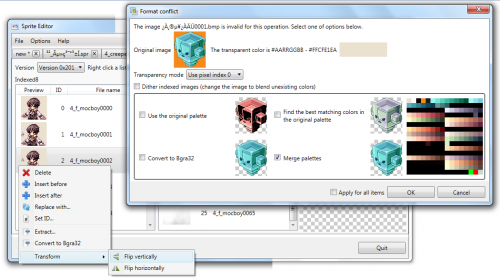 [Fixed] Using the merge tools required the opened GRF to be closed (this was never intended). 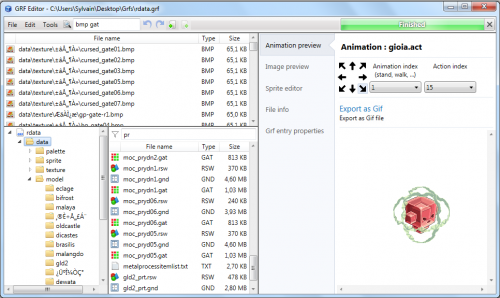 This means you can open the source GRF with the editor and then merge with another GRF.